Rugs create add a classy look and sophistication to your home. To keep rugs, look beautiful, they need regular care and protection. Professional rug cleaning is an important part of preserving the look and longevity of these valuable textiles. Because rugs are so important to us and our homes, it is important to choose a reputable, licensed, and certified rug cleaning company to provide the proper cleaning and care to all your area and oriental rugs. Our professionals have been cleaning and repairing rugs in Phoenix over 33 years. KIWI rug care and cleaning experts recommend having your rugs cleaned and inspected for wear and tear every 2 to 4 years (depending on the amount and type of foot traffic and the amount of stains, dirt and soil buildup. Unlike most other rug cleaning companies, our rug cleaners have been hand-cleaning rugs and utilizing our exclusive thorough 6-step cleaning process all over the country for over 33 years. Our skilled technicians are pros at removing tough stains and odors that come from storage, spills, and pets utilizing the latest advances like our Ozone Room technology. Many rugs — particularly older area rugs, Navajo rugs and many Oriental rugs — are made with rich organic dyes. 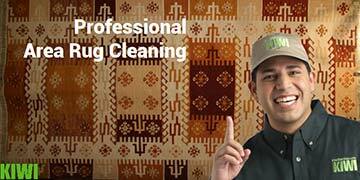 If these rugs take a specialized knowledge in rug cleaning and pro techniques. The same applies to working on through area rugs to expensive and delicate oriental rugs. No matter the type or make, silk, wool, Indian, Persian, Turkish, or Chinese, and all other rug types and makes KIWI can clean them to perfection. Whether your rug is made from synthetic or natural fibers, our Phoenix rug cleaning team has the solutions and equipment required to perform the job to your satisfaction while protecting and adding life to your rugs. And unlike most other companies, we don’t use harsh chemicals or equipment. Instead, we methodically hand-clean both sides and we repeat the process as many times as needed till our cleaner is satisfied that the rug is cleaned fully, and we perform this process on every rug in our care. Experience the KIWI rug cleaning difference for yourself. All our work is backed up with our unmatched 30-day satisfaction guarantee on any rug or carpet cleaning. Call us at 602-899-0554 and speak to one of our knowledgeable representatives to assist you with scheduling a free appointment for one of our technicians to come to your home and pick-up your rugs. We will take them to our warehouse and have the best pros in the business care for your rugs and treat them like our own. We are confident that you will be pleased with the results of any and all the services we perform for you.